Do you ever have those days where you’re just not feeling it? You don’t like your outfit, your hair’s not going right, your make up isn’t sitting on your face well and you just get a bit down? Yep, me too…quite a lot recently actually! I think the winter doesn’t help- My skins worse, I’m cold (constantly), the days get so dark so quickly and I miss wearing cute pretty dresses and being able to get my legs out! I also think one of my biggest issues is comparing myself to others, and it’s so easy to do this nowadays with everyones lives and photos looking seemingly perfect on their Insta pages! Instead of appreciating that obviously not everyones lives are as perfect as they seem and that there is such a thing as edited photos, I seem to get into this miss moany state, pretty much like now, which I sometimes struggle to snap out of! But for 2018 I want to change my mentality on this and adopt a bit more of a sassier, care free attitude! 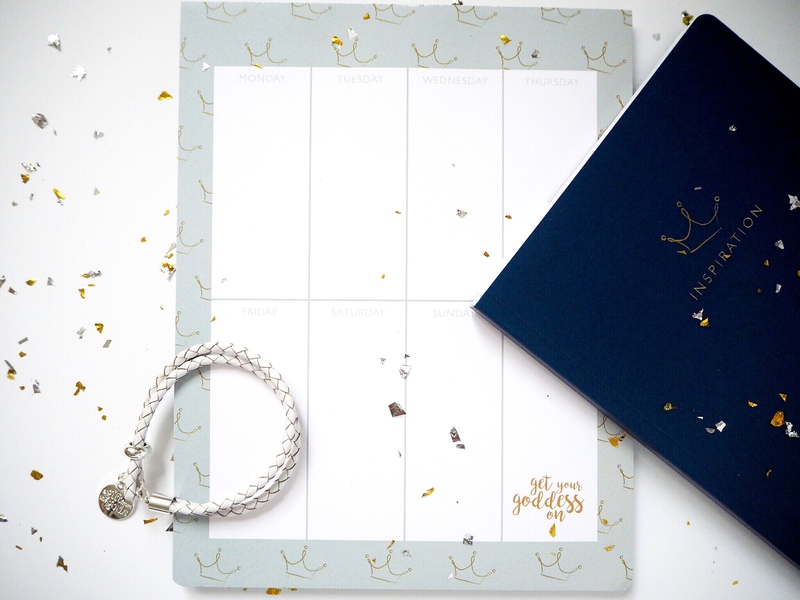 I was recently approached by the brand A Gift From The Gods who sell some really nice gifting items including nightwear, underwear, jewellery and stationary. I was given the opportunity to choose a few items of my choice which was super generous of them! 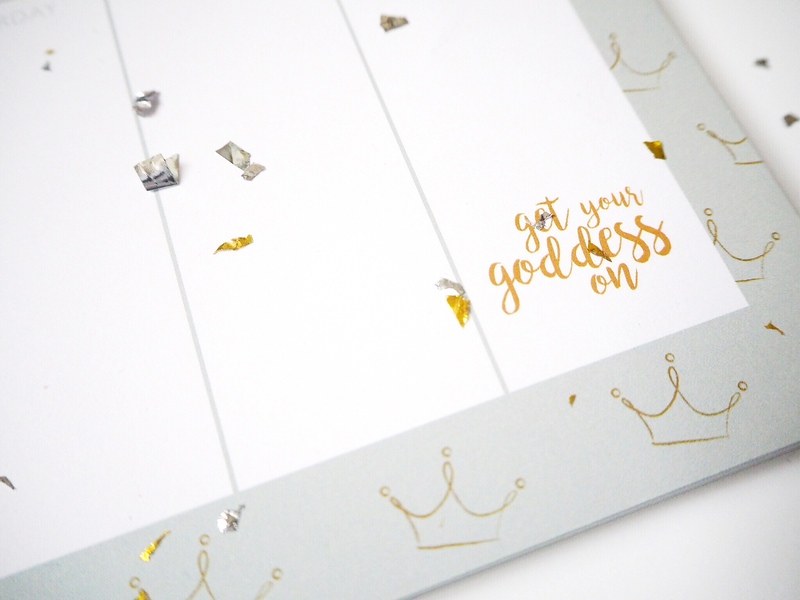 One of the things I really liked about the brand is the cute slogans they have on their items and when I saw their ‘Get Your Goddess’ range, I just knew I had to go for these! I think this motto is definitely something I can look to and could definitely see someone as sassy as Beyonce saying! For me, it means waking up every morning and being the happy, sassy, carefree version of myself! Obviously, sometimes this can be easier said than done. I mean when you’ve got the flu and are all bunged up and sniffling it’s hard to wake up and think to yourself ‘I’m going to get my goddess on today’ but we should! We might not feel like we look our best at times but as long as we feel good in ourselves then that is all that matters!…I’ve also left my top 5 notes to self about how to ‘Get Your Goddess On’ below. First up I chose this curved make up bag with my new favourite slogan ‘Get your Goddess on’. I thought this would be great to use for make up or small toiletries on a weekend away and seeing the slogan in the morning would remind me of the new sassy can do attitude that I want to go for! It’s a really reasonable size and is perfect as currently I have to take two different (smaller) make up bags with me when I go somewhere overnight so this will be so useful for me! You can shop this item on their website here. Next up I went for a weekly planner as I thought this would be a great way to stay organised going into 2018. I also loved the grey and gold colours and thought this would go really well with the decor already in my room. 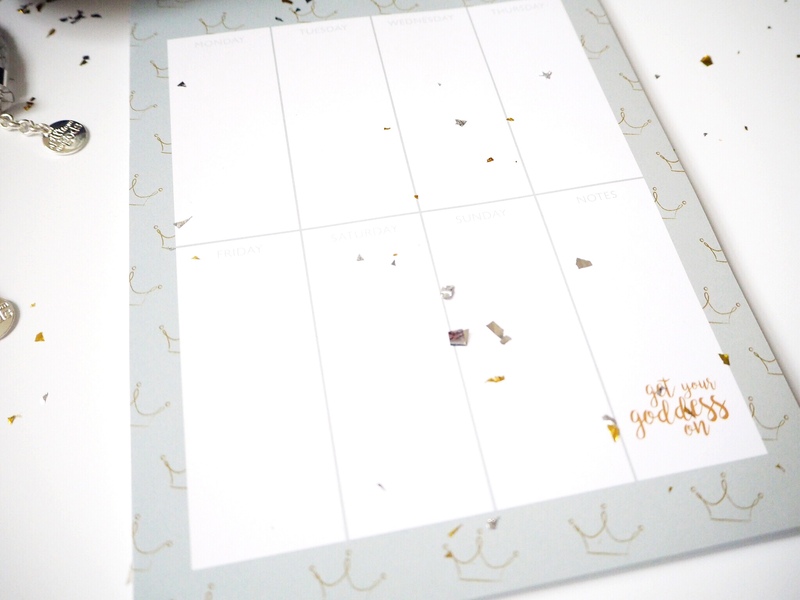 I definitely need to make sure I make the most of this planner as going into 2018 is going to ridiculously hectic with final year uni deadlines and planning more blog posts in! You can shop this mega useful item on the brands site here. 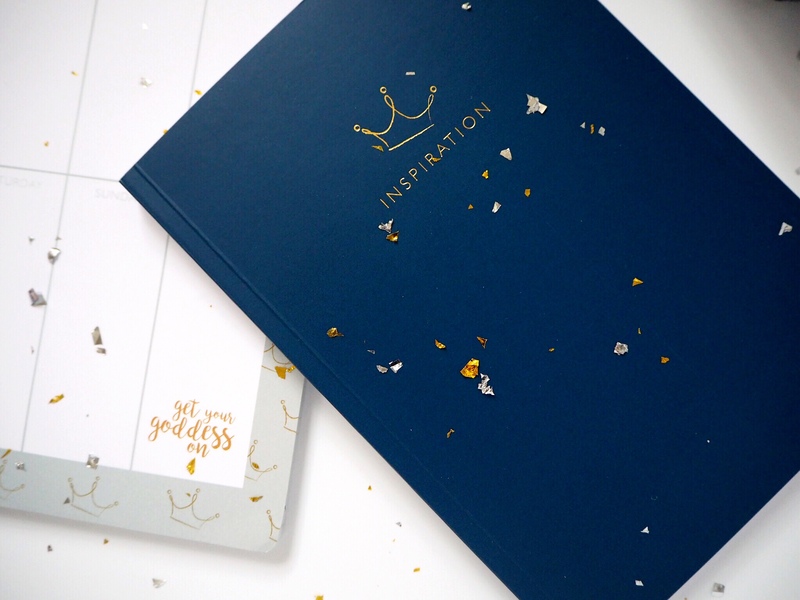 The final bit of stationary I chose was this daily journal, which has the same colour theme as the two previous items but with the word ‘Inspiration’ on the front cover. I thought this would be great for planning blog posts in the New Year, as I already have loads in mind. I want to continue to do lots of Fashion based posts but with a bit more to the theme of the posts, so anyone reading can actually get to know me as a person a bit better rather than just what I like to wear (which is sometimes perfectly fine as well!). But anyways, I would definitely recommend this item and it can be shopped here. To add a bit of variety I also chose this really nice white leather braided charm bracelet with a pearlescent finish from the brands jewellery range. It kind of reminds me of a Pandora one I had a few years ago but this one is a lot less expensive at £15 and I love how it’s really wearable, as the white will go with a lot of my clothes! It would definitely make a really nice present for a friend (or just for yourself!). Shop it on their site, here. Now this item was an extra one which came in the parcel which was a lovely surprise, thank you! 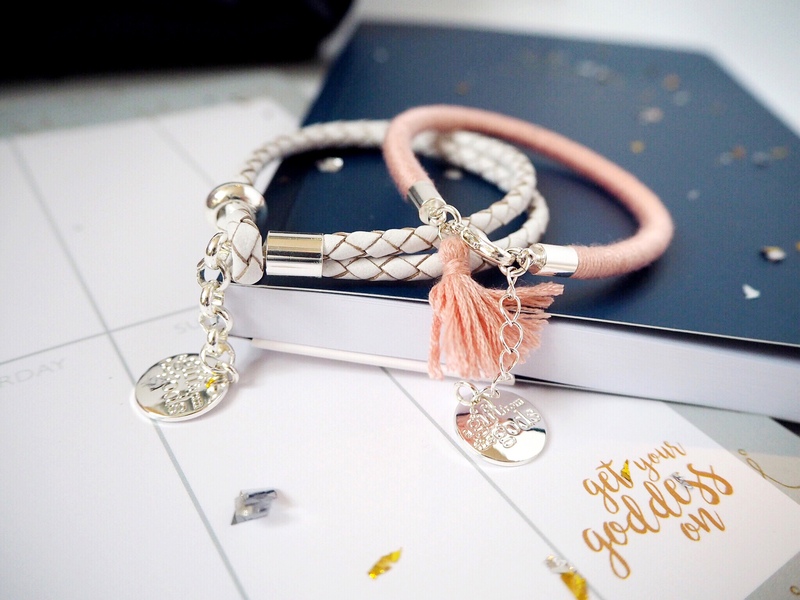 It’s a super cute friendship bracelet with a silver charm which has the same ‘Gift From The Gods’ logo engraved onto as on the leather charm bracelet! This style comes in pink, blue and white so again would make really cute presents for your friends or for holidays and festivals in 2018. This style can be found here. And that’s it…Which was your favourite item?! And of course a big thank you to A Gift From The Gods for sending me these lovely gifts, I can’t wait to start using them and to ‘Get my Goddess on’ *sassy dancing emoji* ! Such a cool concept! 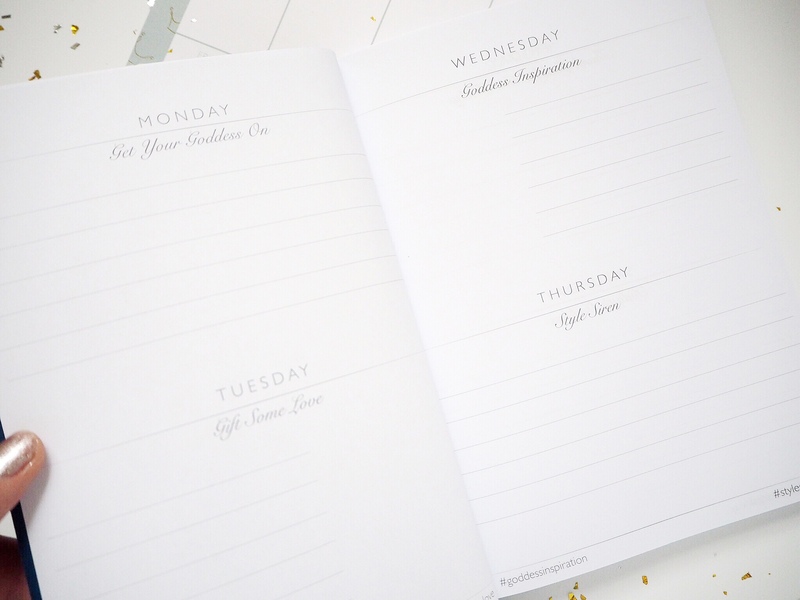 The weekly planner is so pretty 🙂 Thanks for sharing this! Wow, these items are gorgeous! I especially love the makeup bag. All of the items looks lovely! My favourite is the daily journal. You could never go wrong by having another journal, right? So pretty aren’t they! Yes! I’ll definitely get a lot of use out of it! This blog post is really great! 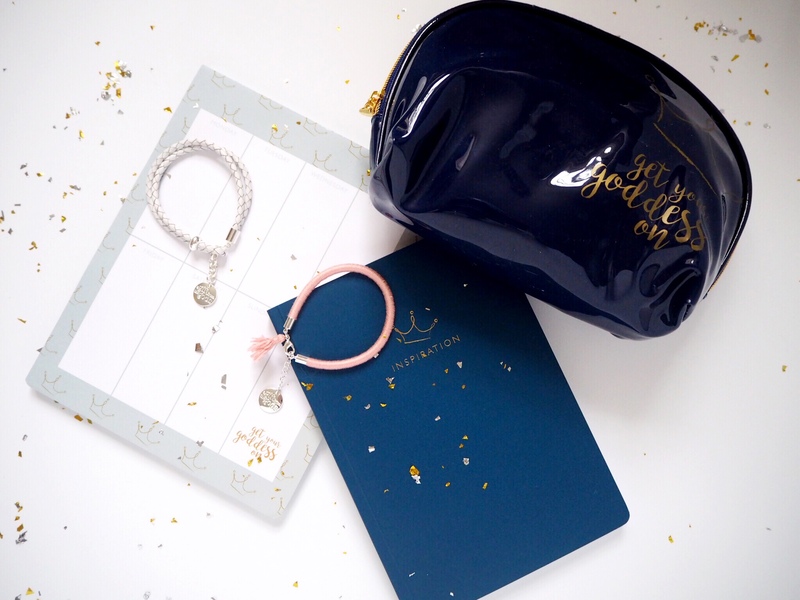 I love the makeup bag and the Bracelet!